Most backup software programs are either installed on the local system or run from an external source that can be a removable drive, CD or network location. Portable backup software programs on the other hand are not that common. Zback is a portable software backup tool for the Windows operating system that can be run from any location. Tabs provide access to the backup software's functionality. The configuration of the backup is handled in the manual backup tab. It might look like backup overload at first glance because of the options the developer has stuffed in the interface. There are basically four sections of importance here. Section one defines the first directory on the local computer system while section three defines the second directory. Section 2 defines the direction of the backup which can either be from directory one to directory two, directory two to directory one or in both directions. It also handles the backup modes which include copying all files, erasing the source, mirroring the directories or updating data. The last section can be used to create filters. It is possible to define filters by time and date or file size and names. A new batch job can then be created after the configuration has been finished. Backups can then be created by switching to the batch backup tab and clicking on the Make Backup List button. This will create the file list for the backup. A click on the Execute Backup List will start the backup process. 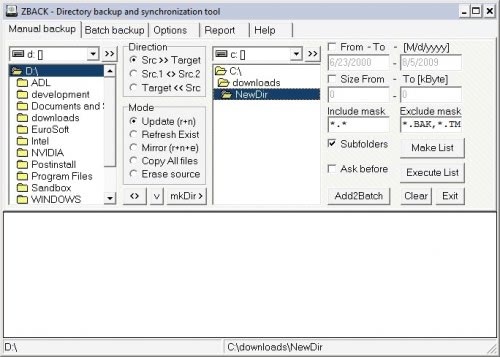 Another option is to click directly on the Batch Run button to create the backup list and start the backup. The third tab of the backup program provides access to a few global options that include enabling reporting, creating empty directories or copying file attributes. Zback is a portable backup software program that can create quick data backups. It lacks functionality mainly thanks to its portable nature. Look more like sync tool than backup one. For sync stuff portable is perfectly fine, but for backup I stick with running as service (I use Cobian Backup). I think the best portable Backup software is ozSync.